A team of zoologists have proposed a theory which says that apart from birds, turtles, and fish, large mammals like cattle and deer may also sense the Earth’s magnetic field. Birds, turtles, and fish are known to use magnetic guidance in migration. Among small mammals, a handful of rodent and one bat species have been shown to possess a magnetic compass. Now, according to a report in National Geographic News, the new research, by zoologists at the University of Duisburg in Essen, Germany, suggested that large mammals like cattle and deer all over the world tend to align themselves with the Earth’s magnetic field. Both types of animals appear to graze in a north-south direction that aligns with magnetic north, not geographic north, according to the researchers, who scrutinised thousands of Google Earth images. Though the findings are fascinating, the reason as to why the non-migrating animals would align themselves according to Earth’s magnetism, is still a mystery. Begall said her team first got the idea to look for cows’ sensitivity to magnetism after one of the co-authors, Hynek Burda, also of the University of Duisburg, discovered such sensitivity in African mole rats. “At one point last year, the question came up whether large animals could also sense the Earth’s magnetic field,” she said. “But of course, it is difficult, or maybe impossible, to do these studies in the lab,” she added. Instead, Begall and her team surveyed Google Earth images of 8,510 cattle in 308 pastures and plains around the world and examined other data collected on 2,974 deer in more than 225 locations in the Czech Republic. They found that the animals, when grazing or resting, tended to face either magnetic north or south. The research team looked for fields all over the world where magnetic north was to varying degrees either west or east of geographic north. 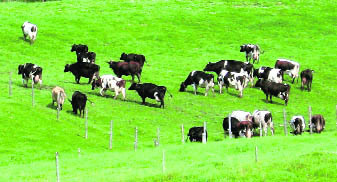 Grazing animals are known to orient themselves to minimise heat loss by wind or maximize their exposure to sunlight. But, the universality of grazing positions across the globe — and across various climate conditions — was not diluted by either of these factors, the study authors found. The researchers concluded that the Earth’s magnetic field is the common factor that could somehow be influencing the animals.